The “Mickey and the Beanstalk” film has been a favorite of mine since I was a child. It was an easy pick for me to create a sculpture based on it. The way the beanstalk is animated in the film it has a life and personality all its own. In the scene where Mickey lies sleeping on the leaf, he seems so peaceful and cozy. That is the theme of this sculpture – being cozy, looked after and safe. 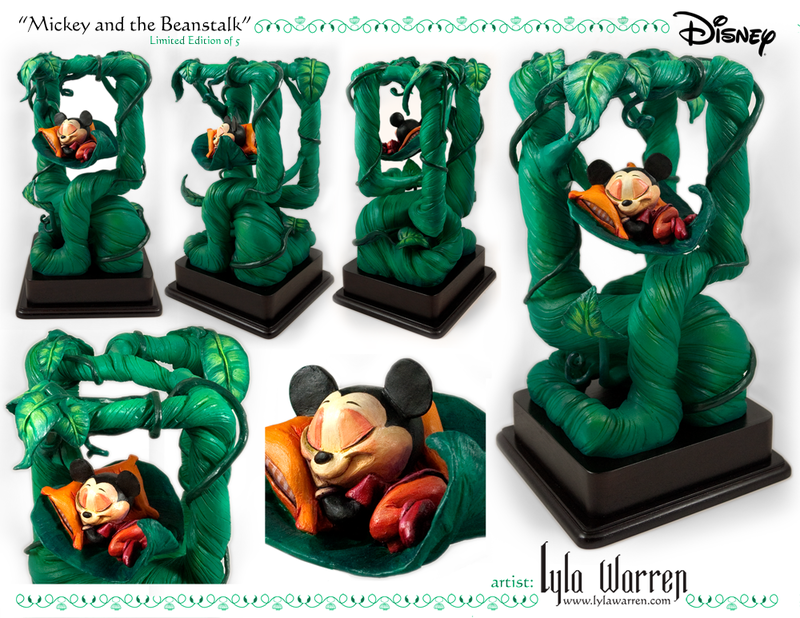 The composition of the piece reflects that emotion by cradling Mickey in the strong arms of the beanstalk. The geometric shape frames and encompasses Mickey like a home. The framing shape also gives the viewers eye an easy place to rest while taking in the texture and wildness of the stalks. I want to evoke these happy, cozy feelings in the viewers as they look at the sculpture. Each piece comes with a Certificate of Verification from me and Certificate of Authenticity from Disney. Each edition is hand casted, assembled and hand painted by yours truly. I also hand-signed, date, and numbered them as well.